Former pro cyclist Lance Armstrong in the garage of his $12 million house in Aspen, Colorado. He’s brought the TV cameras in for a full tour of the house, also showing off his art collection. 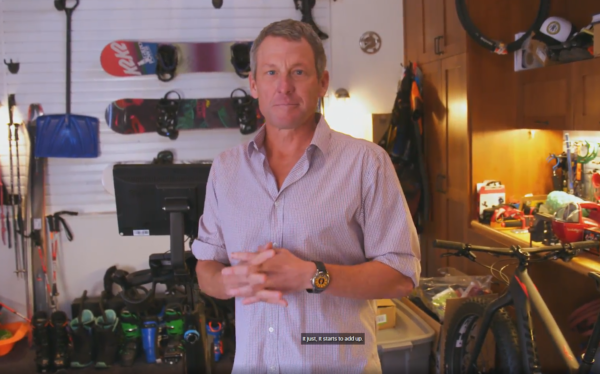 Lance Armstrong’s efforts to publicly rehabilitate his image continue unabated, with the former pro cyclist inviting TV camera crews into his house for a tour. He brought a crew from Architectural Digest into his family home to show it off; including his art collection. Armstrong recently said he was financially rescued by an early investment he made in Uber. He said the various legal actions he faced over his doping cost him in excess of $100 million. And but for that investment he wasn’t sure what would have become of him and his family. Lance Armstrong has now begun his own investment vehicle to fund start-up companies and ideas he believes will grow. The video of his home, below, reveals he has an extensive collection of art with works by Kehinde Wiley, Banksy and Ed Ruscha. And the house itself is also very plush; evidence in itself that he’s doing very well financially despite his doping having been uncovered. One of the interesting things to note about the story that goes along with this video is the absence of any mention of the doping or the controversy around him. It appears he’s gradually building his image again via the US media, though he remains banned for life from cycling. Lance Armstrong house video was shot just before Christmas.